This printing technology, depend ing on the type of applications, uses screens made of synthetic or stainless steel fabrics that let the ink pass through an open mesh to reproduce the printed image. Screen printing has many applications on plastic, paper, cardboard, cloth, metal, wood, glass and ceramic.The screen printing process provides the highest level of print opacity possible. This technology – pad printing – consists of an ink transfer onto an object by means of a photo engraved plate and a silicone rubber pad. 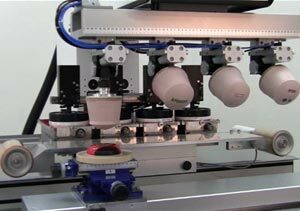 The use of soft pads allows for printing on convex, concave or irregular surfaces. Excellent definitions of printing can be obtained with this process. An engraved die enables the transfer of a relief image from a foil or a printed heat transfer at high temperature onto an object. The hot stamping process is particularly used to achieve a gold or silver print transfer as well as for preprinted foils. Since it is a dry process, there is no drying needed after printing. 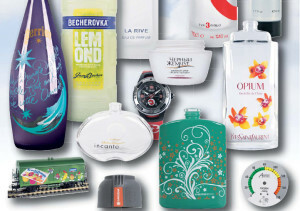 Under certain conditions it is possible to use DOD digital printing to print on objects. The great advantage is that no prepress is required. On the opposite and depending on the object, this printing process is rather slow compared to the other ones. As inkjet printing is a 4 colors process, a white background is necessary: either it is the object itself or a first print.